Shows drivers the special considerations for driving at night. Discusses vehicle, driver roadway factors that can lead to night crashes and incidents. Can help you save money, time, and most importantly, lives. Covers important information for Driving at Night. (1) 13-Minute DVD - Combines engaging video and editing technology with expertise from industry professionals at all levels. 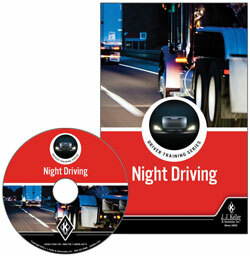 (1) Trainer Guide - Product Code: 45594 (865-H) - Provides information on how to develop, organize, and conduct effective night driving training sessions. (10) Driver Skills Cards - Product Code: 45600 (925-VC) - Recaps the key points from the training program and serves as a reference tool for drivers to use either before or after the training session. Play Program Plays entire main program.